Former inhabitants have left compelling remnants of their interaction with the land at Parker Woodland. The stone cairns scattered over the property are of mysterious origin. Explanations for these mounds range from the clearing of fields by a colonial farmer to monuments erected by a pre-colonial Celtic people or Narragansett Indians. No less interesting are the stone walls, rock-wall pens, and foundations from the days of colonial agriculture. A dam built in the 1760s and two stone quarries enrich the land's history, as does the sawmill at the juncture of Turkey Meadow Brook and Maple Valley Road. The mill, which cut boards and other wood products, operated from the 1760s to 1875. Along the blue trail north of the stone ledge, mounds dating to the 1700s and 1800s remain from settlers' firing stacked wood into charcoal. The most prominent landmark is the Isaac Bowen House, a center chimney colonial on the National Register of Historic Places. The house, barn, and outbuildings all date from the mid to late 18th century. Part of the 1642 Shawomet Purchase made by colonists from the Narragansett Indians, most of the land that became Parker Woodland was obtained by the Waterman family in 1672, where it remained until Caleb Vaughn purchased it in 1760. It eventually came into the possession of Eleanor Goff, who willed 200 acres to George Parker. In 1928, Parker offered the Conventry tract to the Audubon Society of Rhode Island on the condition that it first raise $25,000 to maintain it; after successful fundraising, the land was deeded to Audubon in 1941. With Mr. Parker's death in 1946 came additional Coventry acreage, and at his wife's death in 1955 the Society acquired the Foster tract. In 1978, William Spencer willed the Isaac Bowen House and 65 acres that are now the southwest portion of the property. Named for a descendant of Aaron Bowen, who bought the land in 1743, the house and surrounding land remained in Bowen ownership for over 150 years. No area so rich in history is without local legend, and one of the more enduring of these is that of Biscuit Hill Road, which intersects the Coventry tract. Supposedly the road got it's name during the Revolutionary War when a wagon bound for the campsite of French General Rochambeau's troops overturned, scattering biscuits over the hillside. 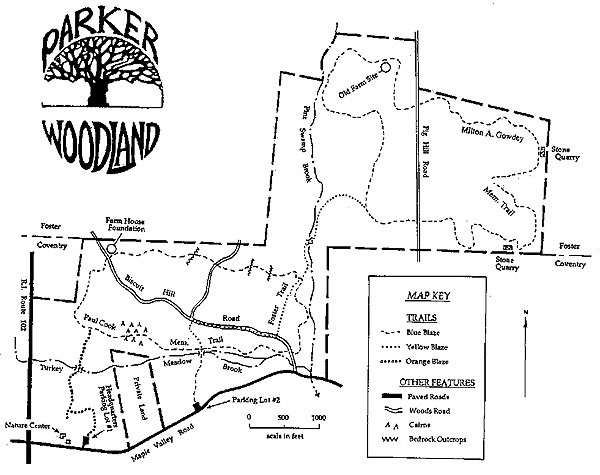 You can view the map of Parker Woodland here.